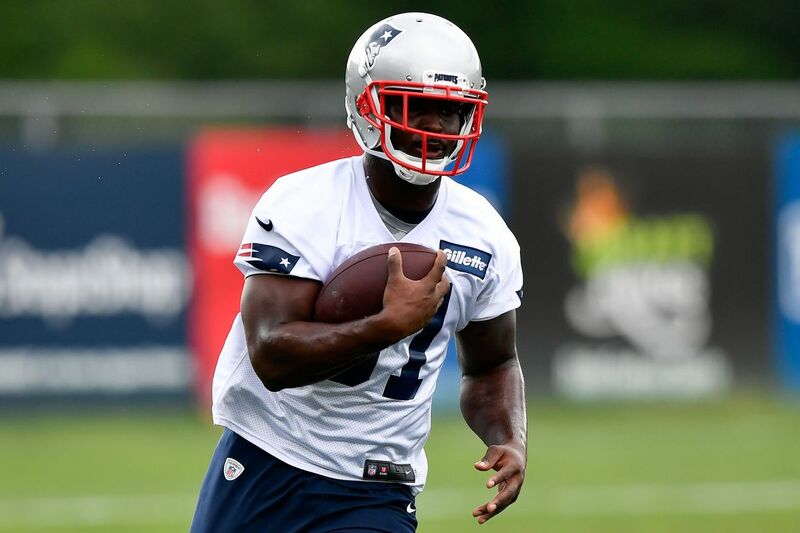 On a recent Locked On Patriots mailbag, LOP Host and ITP Lead Writer Mark Schofield answered a question about New England’s pick of Georgia running back Sony Michel in the first round. Pats fans have been divided by the pick, with some fans excited about what Michel can bring to the offense and others (such as LOP listener Jack Duffin, or this guy in 2015) skeptical of the positional value. The Patriots have often filled the position with cheaper options in the past, so why use a first-round pick at the position now? Has Patriots head coach Bill Belichick changed his tune with respect to ballcarriers? I would argue no, the selection of a first-round running back is not a major departure, either with respect to filling that particular position or how it fits into a general philosophy of team-building. The selection of Michel was on-brand. In recent years, the Patriots have managed to acquire low-cost backs, with contributors Dion Lewis, LeGarrette Blount, BenJarvus Green-Ellis, and Danny Woodhead all costing little in both dollar figures and draft capital. That hasn’t always been the case, however. For the 2004 season, they dealt a second-round pick to the Cincinnati Bengals for Corey Dillon. In 2006, they drafted Laurence Maroney in the first round. Even while paying Dillon and predecessor Antowain Smith decent money, they continued to re-sign third-down back Kevin Faulk, who topped out with the fourth-highest cap hit on the team in 2009, over $4 MM. In 2011, they used a second-round pick on Shane Vereen and a third-rounder on Stevan Ridley. Even last year’s squad featured mid-level veteran contracts for James White, Mike Gillislee, and Rex Burkhead. True, they have not handed out top-tier contracts, but they have employed a mix of low-cost and medium-cost solutions at RB, as they do at most positions. With 30-40 game-day contributors, NFL success involves finding at least some low-cost solutions to help fill the roster. At times New England has gone cheap at RB, but this isn’t the only position they’ve worked within a budget. Recently-departed cornerback Malcolm Butler, hero of Super Bowl XLIX, was an undrafted free agent. They got inexpensive production for years from scrap-heap pick ups Rob Ninkovich and Mike Vrabel at edge rusher, one of the game’s most expensive positions. The wide receiver corps has been bolstered by inexpensive finds like David Patten, David Givens, Jabar Gaffney, Brandon LaFell, and Chris Hogan through the years. The salary cap means teams can’t spend everywhere every year. Teams may find exceptional value temporarily, but eventually they have to pay him or move on to the next guy. The Patriots have plenty of finds like Lewis, Butler, Stephen Neal, and even Tom Brady, but that doesn’t mean they just assume they can find another contributor or star on the cheap. We’ve kind of had to find different players, different schemes, whether it be tight end-based offenses or whether it be going from an odd to an even front defensively, whatever it happened to be, trying to find different ways to capitalize on the talent that’s available. Otherwise, we’re going to get like the fifth-, sixth-, seventh-best guy at whatever the position is. So we’ve tried to take more of our way in areas that are less populated. The sure-fire blue chip prospects (if such a thing exists) aren’t likely to be there when the Patriots are drafting at the end of the first round. As a consequence, the Patriots have to make concessions, taking players with warts or targeting positions that other teams don’t invest as much in. The team’s first selection in 2018, Michel’s teammate Isaiah Wynn, is a great example; Wynn was a star college tackle, but lacks the ideal length for the position and may wind up at guard, a less-valued position. They took a similar approach in 2004, taking tackle Logan Mankins out of a Fresno State and converting him to guard. They’ve used first-round picks on big defensive linemen (Richard Seymour, Ty Warren, Vince Wilfork, Malcom Brown), off-ball linebackers (Jerod Mayo and Dont’a Hightower), tight ends (Daniel Graham and Ben Watson), and safeties (Brandon Meriweather and Devin McCourty), while rarely targeting more glamorous positions like edge rusher (only Chandler Jones) and wide receiver (zero first-rounders). While ITP senior writer Jeff Feyerer suggested, in a piece for Pro Football Weekly, that the demise of the early-round running back is greatly exaggerated, it does seem that teams have varying opinions on this front. If some franchises do think they can get quality running backs cheap, that might depress the market to the point where values can be found. Will compete immediately for starting time and touches in both Zone and Power schemes due to his athletic ability, vision, and patience. Michel is able to press the hole and explode through it, as well as work out of the backfield in the passing game. For a game-plan-heavy team like the Patriots, this versatility adds another dimension to their offensive attack. They can run inside and out, using a variety of concepts, from a variety of personnel groups and formations, and Michel’s passing game ability means he doesn’t have to leave the field on third down or passing situations. They can also use the hurry-up attack to “lock in” a favorable personnel matchup, knowing Michel can fill any conceivable role on the field. While some teams prefer to employ everydown, bellcow backs, the Patriots traditionally prefer to divide roles between an early-down thumper and a third-down receiver. In this respect, Michel is something of a departure, as a running back who can fill both those duties. That probably won’t come to fruition in year one, with Michel dealing with a knee injury and established veterans like White, Burkhead, Gillislee, and Jeremy Hill providing options in different roles, but it is an intriguing direction for the future. Course corrections are par for the course for the Patriots, however. In the Belichick quote above, he talks about adjusting scheme in response to changing personnel trends league-wide, specifically referencing the “tight end-based offenses” they developed from 2010-2012. From 2007-2009, the team leaned heavily on star receivers Randy Moss and Wes Welker, but as Moss aged they elected not to replace him but go in a different direction, drafting tight ends Rob Gronkowski and Aaron Hernandez in 2010. When Hernandez was charged with murder prior to 2013, they switched gears again, returning to more of a receiver-focused approach. Now they appear poised to return to the dynasty’s early days, when they leaned heavily on Smith and Dillon to get things going on the ground. This is different from how the team has operated in the past decade, but it is full of Patriotsy logic. RBs are somewhat undervalued. Brady is over 40 and shouldn’t be relied on to lead the league in pass attempts again, as he did in 2017. And the tight end position is turning out very few two-way contributors; the top prospects in the 2018 draft were either receiving specialists with little blocking skill or blockers with little receiving ability. As Gronkowski ages, the team may envision a future where instead of employing specialized running backs and a versatile tight end, they can use a versatile running back and specialized tight ends. If we think narrowly about the kind of offense the Patriots have run over the last decade, it makes sense to see Michel as a departure from the status quo. But departing from the status quo is more-or-less Bill Belichick’s team-building philosophy. Michel brings versatility and dynamism to the offense as a productive player at a position that is somewhat devalued around the league. What could be more on brand for the Patriots than that?